They eventually went their separate ways to college and Erin got her first job thousands of miles away, in Houston, Texas. Despite the distance, they managed to keep in touch. Unfortunately, tragedy hit her family and, she lost her father suddenly. CJ reached out and supported her the best that he could through the devastating time. At the same time, CJ was working in NYC and miserable, his friends asked him if he could have anything in the world or do anything, what would it be? He said “There’s this girl in Texas…” and next thing you know, he booked a flight to go see her. After a few moves across the country and the state of Texas, they are now happily in Austin, TX as critical parts of the community. They get behind everyone they can with their heart, words, and actions. These two represent #LOVEAGREATSTORY because of their dedication to growth and empowering others to thrive in every area of their life. Their main focus in their communities right now is the intersections of fitness, entrepreneurship, and the journey within. p.s. We release their podcast episode this week. Stay tuned for our incredible conversation as they share even more practical insights as to how they’ve made it work, through grad school, entrepreneurship, building community, all while creating a thriving marriage. It hasn’t always been easy but they’re frank with us and we couldn’t cherish their insights more. For more from Erin + CJ find them in the links below! Looking for a gift this Valentine’s day? 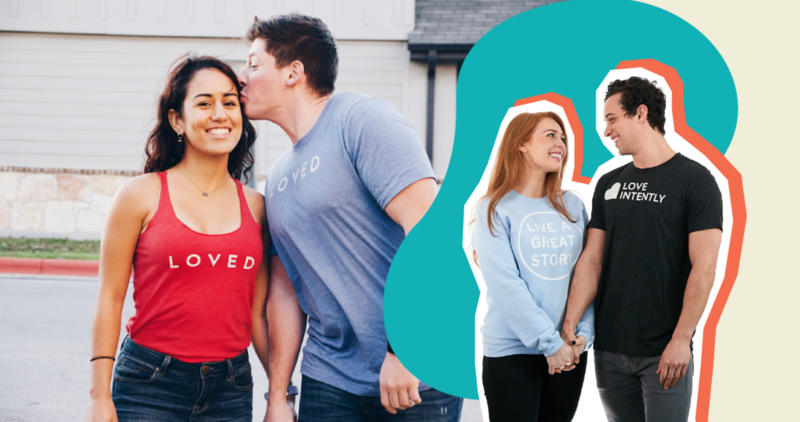 We made an exclusive limited time merch line in partnership with Live A Great Story this Valentine’s season as a reminder for the people who see you to know they are LOVED just for being them and to remind you that you are LOVED just for waking up and being human. Get 10% off your full cart through the link above just for being a part of the Love Intently tribe, and because we love you :)!